The action genre is still strong and kicking, thank you Laura J. Burns and Melinda Metz! Laura J. Burns and Melinda Metz’s new novel follows the story of M. M is short for Memphis and no, not like the town in Tennessee, but the ancient city in Egypt. Memphis is the daughter of an archeologist and when a man shows up saying her father isn’t dead but kidnapped. Things start to get interesting! So I 100% first checked out this book thinking, based on the title, that it would be some sort of YA thriller. Imagine my surprise when it was a YA action fantasy! Not only that, but a book dealing with mythology of ALL KINDS. Egyptian mythology to the catacomb of Paris to even Norse history. All of it interesting….well, to me at least. So let’s discuss plot first. Was it blow my socks of amazing? I wouldn’t say that, but it was definitely different. 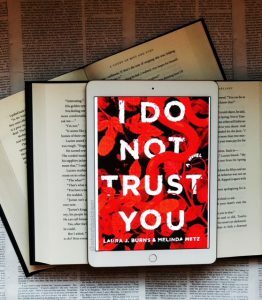 The plot for I Do Not Trust You was something that’s not seen often and it takes a lot of knowledge and incorporates it into an action read. I love almost anything to do with mythology though, so I enjoyed the history part of the book as well as the ‘hunt for secrets’ part. Character development was a little blasé in my opinion. Not too much growth but I think for the premise of the book that was okay. This wasn’t an internal character growth type book. It’s very much an action/heist/adventure book. It deals with the current personalities as they are and gives you a snapshot of them in a specific situation. M’s character is a solid lead, Ashwin is a good secondary, and Mike is all the feels. I need a Mike. I may also need an Ash…. just saying. The storyline was fantastic although some parts were a bit predictable. I think most people will see where the plot goes but nevertheless will enjoy the journey. For books like these, with history and adventure, the journey is what it’s all about. Overall, this was a great stand alone book! I enjoyed every moment of it and read it in two days. (Extremely quickly). If you’re looking for something fast paced and well rounded. Give it ago! I would recommend this to anyone that enjoys YA or YA fantasy. It was extremely fun and I slightly wish I had taken it on my flight to read. Oh well~ next time. Thank you !! I have just written the name of this book on my wishlist 😀 Greetings from Argentina. !